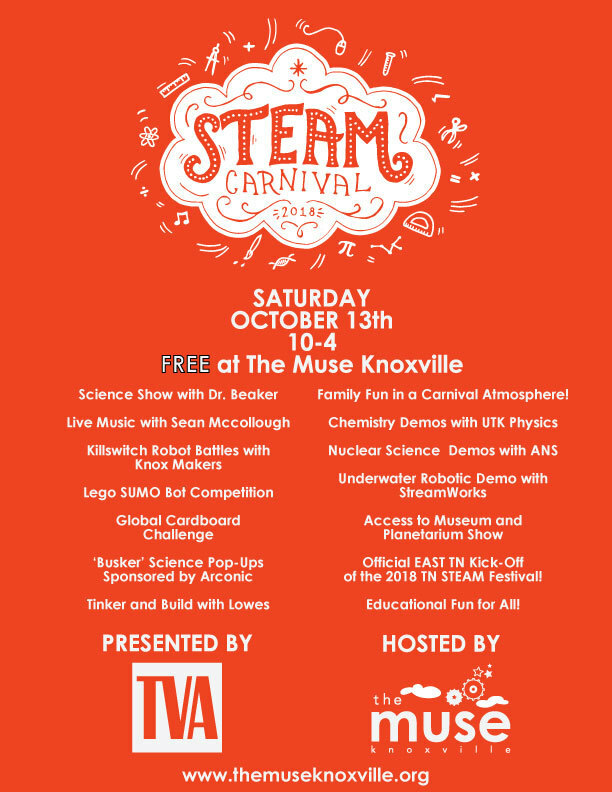 Help us kick off the TN Steam Festival with a family-freindly carnival at The Muse! Be inspired at this event with immersive activities, play and fun! Activities include a science show, live music, science demos, arts and crafts, and more! Children's activities are geared for children ages 2 to 10, but all ages are welcome! This event is rain or shine and admission is FREE! The Muse will NOT be open for regular business hours this day, only open during the event. Parking is available in lot next to The Muse and in the lower lots of Chilhowee Park and is also FREE. Muse Knoxville sells light snacks and drinks in the gift store, but food and drink will also be available for purchase.